Cupcakes 'n Daisies: It's Tools Tuesday . . . . Here we go again . . . just in case this is your first visit to my blog, I've cleaned out my tools drawer, any ruler, template or tool that I've bought, but never used, is being tested to determine if it gets to go back in the tools drawer. So far, most of the tools I've tested have not gotten the C n D stamp of approval, let's see how it goes today! When it comes to specialty rulers I have the following 3 criteria that determine if I use them. Most important to me is accuracy, then comes speed, and finally fabric savings. If a ruler is accurate, but wastes a ton of fabric in the process, I don't care, I'm all about accuracy. But if the ruler is accurate, and speeds things along, it's also nice to save a little yardage. So I guess having all three criteria in one tool makes it the perfect ruler for me. 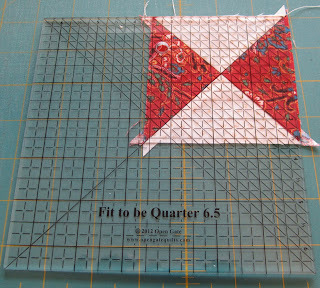 Up today, this Quilt in a Day ruler. So the purpose of today's ruler is to "make perfect half triangle squares and quarter triangle squares in sizes up to 6 1/2 inches". I've had this ruler a long time and have never used it. The package for this ruler had never even been opened. I think I bought it when I was just starting out and hooked on the Quilt in a Day flying geese rulers and figured this would be a good ruler to have too, a ruler that makes half square triangles and quarter square triangles, what's not to love, right? The directions are great, lots of illustrations with clear, concise, and easy to follow instructions. Way to go Eleanor Burns! There are 17 steps for making 8 half square triangle units, seemed like a lot of steps for a simple block, but I was up for the challenge. Besides, they are supposed to perfect, and perfect doesn't usually happen in a couple of steps! I decided to make 3 1/2'' finished hsts, according to the directions this required two 9" square pieces of fabric. That seemed like a big piece of fabric, but then you're getting 8 units, so OK, I guess. First you draw lines corner to corner, then sew a 1/4" from the drawn lines. Then you cut squares horizontally and vertically. Then cut on the drawn lines. That gives you 8 units. Place the appropriate square up line on the ruler on the stitched line and trim. For 3 1/2" finished units I used the 4 inch square up line. Then you trim the tips at a 60 degree angle. You then open and press to get your finished unit. I decided to check the size of the finished unit for accuracy. It came up a tad short, which I found disappointing. The directions account for this happening and instructed me to adjust the placement of the square up line. For the record, my seam allowance was exactly 1/4". This is one method to make half square triangle units, not a method I will ever use, but it works. I don't think it comes close to the ease and accuracy of the Easy Angle for hsts and if I didn't have an Easy Angle I would just go with the draw a line down the middle method. I don't always have large squares of fabric, sometimes I only have strips, and those won't work for this method. It all just seemed like a lot of work to me. So that was pretty much a waste of time, lets see how the ruler works for making quarter triangle squares. Again, wonderful directions were provided with the ruler. This ruler can only trim units that finish at a whole or half size, i.e., 6 or 6 1/2 inches. it's very easy to line up the diagonal lines on the vertical seams. But then, it's also easy to trim this unit using your ordinary Omni Grid ruler. And easier still to square up these units using the Fit to be Quarter Ruler. So in summary, the Quilt in a Day ruler does do the job, but I think there are easier and better methods and rulers available. This ruler won't be going back in my ruler drawer. Thanks for all that information. I often wonder if all these fancy rulers are worth the money. Great tutorial. At this point in my life, space is important and tools that I won't use has no place in my drawers! I have used this one and not had any trouble with the HSTs being short. Did you the correct measurement on the edge when you turned it around to cut off the wings? I use this ruler all of the time and end up with very accurate HST'S. I love it. Good information about this ruler. I also have a drawer or rather a wall of rulers most of which I never use. I think I am a tool junkie. Get you some Bloc-Loc rulers and it will be all you need for those half square triangles. LOVE Them. They have replaced a LOT of my stuff. Thelma, I love your Tools Tuesday blogs. 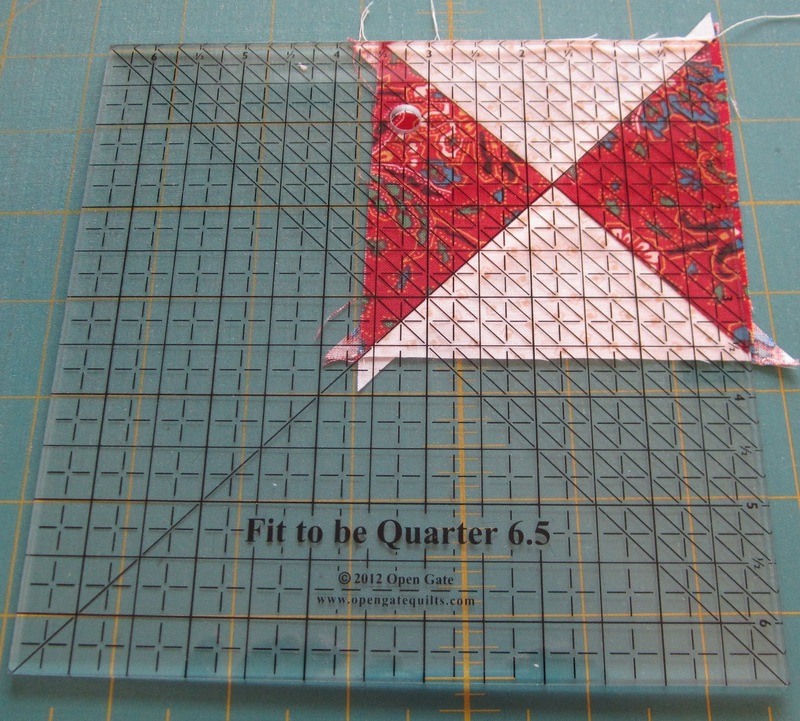 If you are giving the half triangle squares & quarter triangle square (Quilt in a Day) ruler away, I would love to have it. Most of my quilts are made from large pieces of fabrics. I do not buy jelly roll collections so this tool may be very helpful for me to use. I look forward each morning to reading your blogs. Thanks for being there. It's Yours! Several folks have left comments that it is a good ruler, I'm glad it will go to a good home! Email your mailing address to me at Cupcakesndaisies@gmail.com and I'll get it in the mail! I used that Eleanor Burns' Triangle ruler for years but I haven't used it for awhile now. As you wrote, it does a terrific job but I prefer other methods. It's funny though because I've never really cared for the Easy Angle method for the same reason - it's a great method but I prefer others. And that's the real test, isn't it? Which method works best for you? Love this ruler series. One of these days I need play with all of mine. I know I have some that probably need to find new homes. I was wondering if you have a double wedding ring template set in your collection. I want to buy one, but not sure which brand to buy...maybe Marti Michell. Love to use this ruler to double check units I have sewn with the easy angle. I love how I can square up before I press and do both sides. I square-up the quarter triangles before I open also so I can do all 4 sides at the same time. It's all about what works for you.